My sister, Melanie came to me this past September wanting to lose weight. She was at the heaviest she’d ever been, extremely low on energy, suffering from chronic back pain, borderline anemic and feeling pretty irritable on the daily- not fun and certainly not a joy to hang out with. (No offense Mel). Despite never lifting a weight a day in her life, Melanie was always able to maintain her slim figure most of her life by going for the occasional run and doing a lot of walking. As we know, once women enter their thirties, things start to slow down. They inevitably did for her. Doing the bare minimum in terms of physical exercise and not paying attention to her diet eventually crept up on her. That’s when she reached out to me. I’ve been a coach for over ten years and not once had she ever asked for my help with anything fitness or nutrition related. So when she did in September, I was ecstatic. Finally, I would have the opportunity to help my older sister and empower her. More than anything, I wanted to teach her about fitness and nutrition and I finally had the opportunity. I quickly got to designing a workout routine for her- this came easy for me to do since she was a novice in a gym setting and never lifted a day in her life. I decided starting with basics first with a focus on the core was a must since her job consisted of lots of manual labor which was why she was experiencing a lot of back pain at the time. When it came to the nutrition, I explained to her the first thing she needed to do for me was to start tracking her food, aka her macros. The reason for this was so I could design an individualized nutrition plan based on her current eating habits. I wasn’t too surprised when I discovered she was significantly under-eating. A woman, 5’7, weighing in at 130 pounds at the time, was eating 900-1100 calories a day! Most of her food choices consisted of processed foods such as bread, pasta, pizza, and candy. She worked long hours (10-14 hour shifts) and a lot of those hours were on her feet. 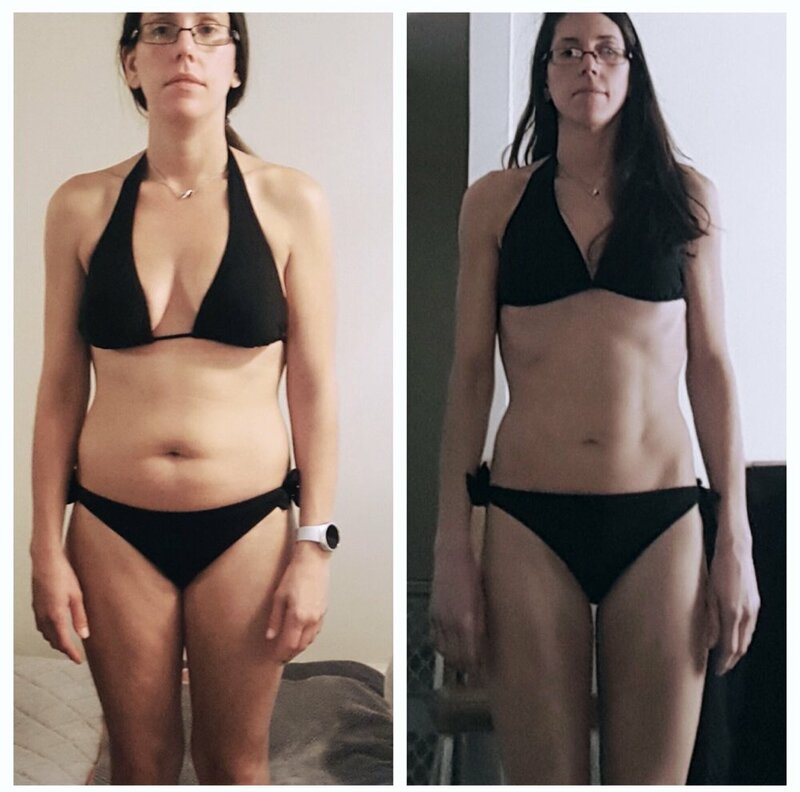 I knew she had been probably under eating but for a woman her height, weight, and activity level I was shocked to find just how severe of a caloric deficit she was in. I told her the first thing she needed to do was trust me. Then I explained to her the only way she could lose body fat, in the long run, was to start eating more. She was shocked and skeptical. Once I explained to her what Reverse dieting was and how more than likely her metabolism had stalled out from eating so little she agreed to start eating more. Each week, we added calories into her diet while focusing on nutrient-dense foods. Along with strength training in the gym and eating more, she started to see results- quickly. Within a week, she noticed her energy shift. She was literally jumping out of bed in the morning. As soon as she started eating better, she had much more energy in the morning. This was something that had been plaguing her for a long time and she immediately noticed a difference when she started making better food choices. The second was her back pain. After three weeks of lifting three times a week in the gym and calories up by 150 overall, her back pain was getting better. She started meal prepping at home and bringing her food with her to work. She was consistent with her workouts and was hitting the gym 3x a week strength training- no cardio. We continued to increase her calories by 50 each week. Getting her protein up was a huge goal of mine considering she was having less than 30g a day before we started working together. Eating an adequate amount of protein is crucial for anyone wanting to build muscle and drop body fat. Fast forward two months- Melanie was down 10 pounds and eating 1700 calories a day and climbing. The more she saw results, the more she trusted the process. She realized how important it was to maintain a healthy diet and workout routine. Today, she is eating upwards of 2500-3000 calories a day and is in the best shape of her life! Like Melanie initially did, many people don’t think eating more can be a solution to losing weight. But many people are stalled out with their results because they wind up dropping calories too low for far too long. If an individual cuts calories below their maintenance and is using more energy than what they are taking in for fuel, they will initially lose weight, most of the time. There are other factors that come into play here but yes, one can expect to lose weight if in a caloric deficit. The problem is one of metabolic adaptation: excessive exposure to a given stress—in this case, reduced energy intake—leads to a slowed metabolic rate. This is what Melanie was experiencing when she came to me for help. When you begin to diet and reduce caloric intake, your body taps into energy reserves of stored fat to continue living. Everything from brushing your teeth in the morning to chasing your two-year-old around the house -all the various biological processes necessary for life require energy. Most of us have quite a bit of that stored as subcutaneous fat. In the ideal case—at least for the purposes of getting leaner—we’d just keep dieting and keep burning fat. Evolutionary biology tends to run counter to our vanity, however: after a few weeks in a caloric deficit, we stop burning fat. Our production and secretion of metabolism-regulating hormones generally decrease. While “starvation mode” isn’t an actual scientific phenomenon, it’s a decent catch-all phrase for what’s really happening. Put as simply as possible: your metabolic rate slows to match your caloric intake. This is why Melanie couldn’t drop any weight eating 900 calories a day previous to reverse dieting. Going into a restrictive dieting phase often disrupts the body's overall homeostasis. This includes the metabolism, endocrine system, nervous system and neurological system. If you’ve ever dieted hard before you know the struggle is very real. If you don’t come out of this extremely restrictive dieting cycle slowly and if you go back to eating “normally” without reverse dieting, you can gain upwards of 15-20 pounds in a very short amount of time. Obviously, not the goal. This is why reverse dieting is critical. If you are someone like Melanie, stalled out on weight loss and not knowing where to turn to, the answer just may be to eat more. I know- it can seem scary AF, but it just may be necessary for your long-term health. Doing more than 4-5 hours of cardio a week. (For women) Lose or irregularity of menstrual cycles. If you are someone who is experiencing most of these symptoms listed above, reverse dieting is something you should consider. Dropping calories and doing more is not always the answer. I was happy to empower Melanie and teach her how to reverse diet in order to fuel her body and mind to her most optimal level. She is currently enjoying life to the max while in the best shape of her life. Reverse dieting may not be the “trendy” way to lose weight or a method one would think of when it comes to shedding body fat, but it just may be the answer you are looking for.